Alright, now hopefully this next beverage is a little better than Malta Hatuey. It kind of has to be since vomiting in my own mouth is better than Malta Hatuey... it's called Materva. Actually, it's called Materva Yerba Mate Soda. I don't know what Yerba Mate Soda is, but hopefully it's good. Thank you, whoever makes this! The most simple way I can put it is this, it's a sweet apple soda. I haven't tried many apple soda's in my lifetime, but this one is tops thus far. In fact this is one of the smoothest apple soda's I've ever had as well. Wait a second, hold that thought. After reading the packaging, there is no apple flavoring in this. The only extract that is in Materva is "Extract of Mate". This has piqued me into doing some research. One moment please. Ah! 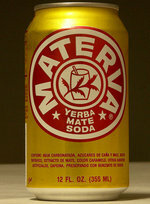 A Yerba Mate is a species of holly native to subtropical South America. Apparently the extract of mate is quite a positive thing, with what some believe to be health benefits. Well, either way it still tastes like a sweet apple soda to me, but if it's holly, let it be holly. I would definitely drink this again, the packaging is a little bland, but I really don't mind. I now understand what the cup and twig are on the front, thanks to my good old fashioned research.